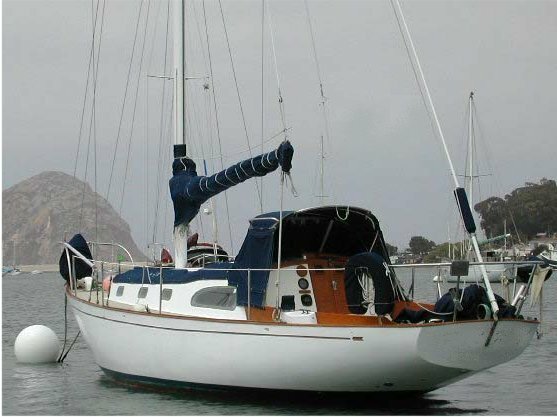 There are a number of stories about the origins of the ERICSON 35-1. One has it that the molds for this, the first of all the Ericsons, were purchased from Pearson Yachts. "Pearson Yachts decided to discontinue the manufacture of ALBERG 35's at its Sausalito, CA plant. They sent the molds to the San Francisco dump where they weren't broken up, supposedly because the crew stopped to eat lunch. Someone saw them, claimed them, and trucked them down to Orange where they set up a manufacturing facility. Bruce King redesigned the keel, taking out 500 pounds of ballast. He also redesigned the cabin trunk with windows with a shape similar to that of the Columbia's of the period. Pearson sued Ericson over the hull. They lost. Columbia sued Ericson over the window shape. They won. As a result, later windows had the same general shape but were split in two." The only thing that can be said for certain is that lines of the ERICSON 35-1 do appear similar to those of the ALBERG 35. Another, completely different ERICSON 35 was introduced in 1969, designed by King. (Here referred to as the ERICSON 35-2).